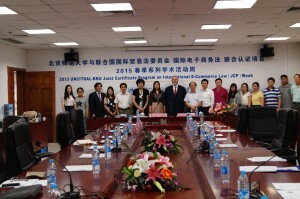 2015 UNCITRAL-BNU Joint Certificate Program on International E-Commerce Law (JCP) Spring Week was successfully held by Beijing Normal University on June 21-26. 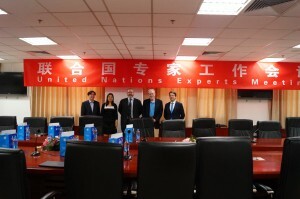 Mr. Renaud Sorieul, the UNCITRAL Secretary and Co-Chair of JCP International Expert Advisory Committee, Mr. Joao Ribeiro, the Director of UNCITRAL Regional Centre for Asia and the Pacific and the other International experts attended the series of events and showed their strongly support. A series of academic activities were held during this week. Mr. Renaud Sorieul, the UNCITRAL Secretary, Mr. Joao Ribeiro, the Director of UNCITRAL Regional Centre for Asia, Mr. Jae Sung Lee, the legal officer of UNCITRAL, Prof. Xue Hong, Co-Director of JCP, and other international experts attended the meeting. They discussed the details of training on International Trade Law for senior officers from Democratic People’s Republic of Korea. 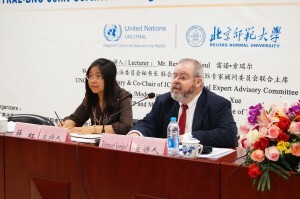 2015 UNCITRAL-BNU Joint Certificate Program on International E-Commerce Law Spring Week – International Expert Public Lecture given by Mr. Renaud Sorieul, the UNCITRAL Secretary and Co-Chair of JCP International Expert Advisory Committee was successfully held at Room 1824 of New Main Building. The lecture was co –host by IIPL of BNU and UNCITRAL-BNU Joint Certificate Program, and supported by The China International Economic and Trade Arbitration Commission (CIETAC). 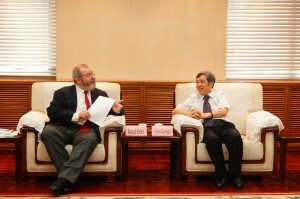 Prof. Xue moderated the lecture. More than 30 arbitrators and officers from CIETAC, along with scores of BNU post-graduate students, joined the lecture. Mr. Renaud Sorieu’s lecture on a series of international conventions administrated by UNCITRAL was informative, insightful and interactive. A couple of arbitrators had the interesting dialogue with Mr. Renaud Sorieu. The lecture ended in applause. 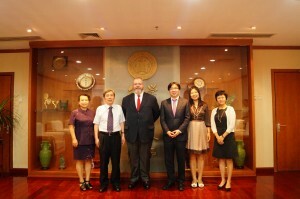 Vice president of BNU, Mr. Chen Guangju had a meeting with Mr. Renaud Sorieu, the UNCITRAL Secretary and Co-Chair of JCP International Expert Advisory Committee on June 22. The meeting was about the cooperation between the two sides and the future development. 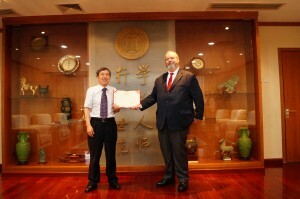 In the meeting, Mr. Chen awarded Mr. Renaud Sorieu the certificate of “Co-Chair of International Expert Advisory Committee of BNU-UNCITRAL RCAP Joint Certificate Program on International E-Commerce Law” to appreciate his contribution. 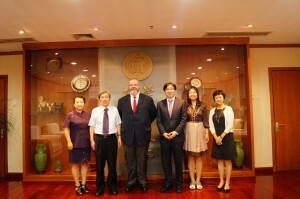 Mr. Chen introduced the history of BNU and the Law school, expecting the future cooperation and expressed his support on UNCITRAL-BNU Joint Certificate Program on International E-Commerce Law. While Mr. Renaud Sorieu spoke highly of the progress of Co-joint program. He said that UNCITRAL had made a lot accomplishment on legislative work on International E-Commerce Law and it’s a pleasure to cooperate with BNU to build the first program about International E-Commerce, he looked forward to more far cooperation. Mr. Renaud Sorieu indicated that United Nations attach great importance on UNCITRAL’s work as the development of global economic environment. He thought international trade law would play a more important role in promoting living standards than international Criminal Law and international human rights law. He hoped more professionals would work for United Nations to provide the power of China. Mr. Chen said that Law school of BNU put such a high value on international communication, and trained many students with ability to use second foreign language, hoping them to make contribution to the development of international communication. Prof. Wang Xiumei, Director of international cooperation and communication, Beijing Normal University, Prof. Xue Hong, Co-Director of JCP, Professor Zhang Hong, Associate Dean of Beijing Normal University Law School, and Mr. Jaesung Lee, the Legal Officer of UNCITRAL attended the meeting. Prof. Xue gave a lecture to the Senior Officers from Democratic People’s Republic of Korea on United Nations Convention on the Use of Electronic Communications in International Contracts and the other international trade laws.